Q. Was it much more difficult, Djokovic, than today? We don't want to take anything out of Ferrer, but what did you feel in the court today? Do you realize that you haven't done anything today? You won only eight times; (indiscernible) nine times Wimbledon. So it's nothing. RAFAEL NADAL: The feeling on court was a great. Even the match against David always is difficult. I think the score is much easier than what the match is today. I think for moments I played great; I think few moments in the match I played at very, very high level.Very happy, very emotional, very important victory for me. This remain this step after the comeback of the injury. I won in 250 first, then 500, then Masters 1000, so remained the Grand Slam. It happened today, and it's a big personal satisfaction that it happened.A lot of people helped me a lot to be here back today. I will not say everyone because I will forget, but because of them, today here I am with this. That means a lot more me. Q. Good morning. How did you feel winning this tournament for the eighth time? Is it as fantastic as the first time? RAFAEL NADAL: It's difficult to compare. Every moment is different. I never like to compare. I never like to compare years, but it's true that this year means something very special for me, no.Five months ago nobody of my team dreamed about one comeback like this because we thought that going to be impossible. But here we are today, and that's really fantastic and incredible.So very, very happy. Just I am enjoying a lot all these emotions since I came back. Q. Rafa, what went through your mind when the protester came on the court? RAFAEL NADAL: The guy? Nothing. It's very quick moment. I felt a little bit scared at the first moment because I didn't see what's going on. I just turned there and I watch a guy with some fire, so I got a little bit scared at the first second.But then I see that it's one of those things that nobody can prevent. Just can say thank you very much to all the security guys. They did just amazing work.They did very quick, and they were very courageous about what they did in the first moment. So just can say thank you very much to them. Q. Do you feel you're now in the best possible situation to push to get the No. 1 ranking at the end of the season? RAFAEL NADAL: No. That's not my goal today. I am in a good position in the Race, it's true: a lot of points, and only with nine tournaments. So that's something amazing.Without playing Miami and without playing Australia, today I have 7,000 points on my computer. So that's much more than what I thought or what I dreamed.But to be No. 1 in this era, you need to play during the whole season. You have to play during the whole season and do well during the rest of the season, because the rest of the players are very competitive. They're going to be there. Q. After all the difficulties that you've had over the past year, how much has it helped you when you've been on the court in the past week and you've faced tricky moments there to look up to your camp and see all your family and all your team? RAFAEL NADAL: They were always there, so nothing special during these weeks. I know they have been there forever and they have been there always in the tough moments.When everything is right, when everything is good, you are winning, you are healthy, it's great to have the support. But when you really need the support is when the things are not going the right way, when you are injured, when you have some low moments.I feel very lucky that I have a great family and team around me and a lot of people that supported me from outside during this seven, eight months. I received hundreds of messages of support in my social networks, in my personal phones.When you are a little bit sad and you receive all this support, it's a lot of positive energy. Every message of these ones have a special significance for me. Q. When you had your terrible injury and you were off the tour for months and months, what were some of your toughest thoughts? Did you ever doubt you would come back to this level? RAFAEL NADAL: I am a positive guy. I am a positive person. I think always in the positive way. But the doubts are part of this life. The persons who don't have ‑‑ people who don't have doubts is because they are so arrogant. The doubts are in everything. Nothing is clear in this world, I think. So I for sure have doubts, but I work as much as I can to be here. So that's the only thing I can do. I can have doubts, yes, but if I don't work, it's sure that I will not be back. I have doubts, but I am still working with the positive attitude and with the right mentality. Q. You've told us for many weeks now that you don't want to tell us about your knees. Is now the moment you can finally tell us how your knees are? Q. Last year you came off for the rain; this time you stayed on the court. Do you think it affected the match at all, or were you happy to keep playing? RAFAEL NADAL: Last year I think the situation was much more dramatic than this year if we compare the rain of last year with this year. Last year we had to stop the match for the rain; this year we didn't stop the match for the rain. So that's big difference.I don't like to play with these conditions. Probably my opponent neither. But the weather is today, that's all. Q. 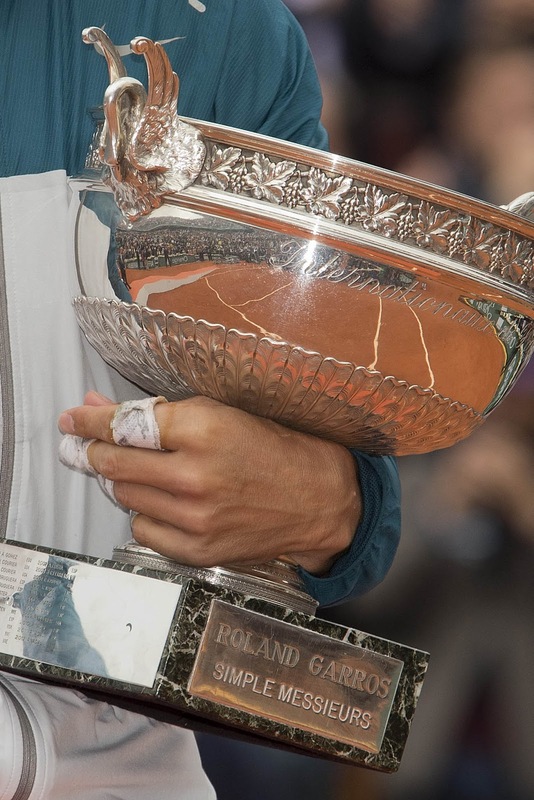 It's obviously difficult for you to choose between all of your Grand Slam wins, but given what you have been through with the injury and the doubts, do you think this one is perhaps your most special? RAFAEL NADAL: I will not say that. This one is very special one. When you have period of time like I had, you realize that you don't know if you will have the chance to be back here with this trophy another time. So that makes this one very special. But I had in the past very special moments in important matches too. That is not fair, because if today happened I say that's the most special one. Today this one is the most special one, but last year was very special; 2008 Wimbledon was very special; 2009 Australia was very special; 2010 US Open was just amazing because I had to complete the Grand Slam. So all these moments in my career was very, very special for me. When you make something new every time, it's a very special feeling, you know.